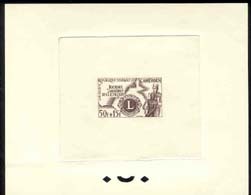 10506 EP CAMEROUN (1962) Lions emblem*. Leper*. Scott No B35. Yvert No 337. World Leprosy Day. Sepia Printer's Die Proof. Only 4 copies printed. Very rare!